Sitting for an extended period at your work leads to bad posture, multiple health problems and add stress to your mind. To avoid all these types of problems, it’s essential you have the right ergonomic chair at your office that tends to support your lower back and provides the good posture and support to your body. Today on our blog, let’s check out how to choose an Ergonomic office chair and what are the benefits of choosing the right one in detail. What type of Ergonomic Chair would fit? 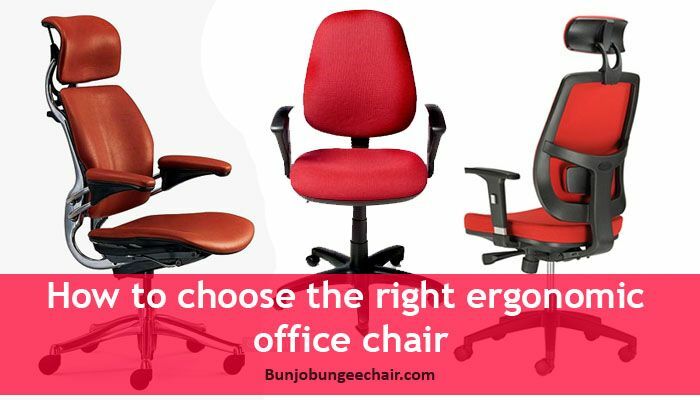 You can find hundreds and thousands of office chairs in the market, each has its characteristics and uses, but it’s important that you choose the right ergonomic office chair for your work as per your needs and specifications. Seat Height: Pick the chair where the seat height can be adjusted so that you can adjust it based on your height and needs, generally a seat height of office chair ranged from 16 to 21 inches, this would fit most of the people and makes the comfortable to have their feet flat on the floor. Seat Depth & Weight: Choose a chair with the vast seat so that any people can sit in the chair with maximum comfort. A standard ergonomic office chair would range from 17 to 20 inches; this allows people to sit with more comfort. Similarly, note whether the forward and backward tilt is adjustable. Lumbar Support: This is the most important medium in choosing the ergonomic office chair, pick the one that can support your back correctly, choose the one that has the inward curve within the lumbar support so that there are no chances for slouching. Ergonomic office chair with the lumbar adjustment is mandatory to support your lower back. Backrest: A good ergonomic office chair will have the broad range of 12 to 19 inches and comes adjustable so that you can make it according to your needs. Choose the chair with the backrest that supports the natural curve of your spine and also to your lumbar region. Material: Choose the chair with the high-grade premium quality for the chair to come for long periods, the chair should be enough padded to provide the comfort while sitting in the chair. Choose a chair with breathability too; this is better to provide the smoother effect. What are the benefits of choosing the right ergonomic office chair? Once you are clear in choosing the features, you will be able to pick the right one for your office employees, as their comfort is important for your company’s growth. Here are some of the health benefits of choosing the right ergonomic office chair for your office employees. Provides the deeper comfort for the workers even while sitting for an extended period. User-friendly, a person with any height and weight can use the chair with ease. Reduces the neck problems caused due to prolonged sitting with the help of the neck support. Padded seat provides deeper support to your buttocks and hips. Makes your work simpler and easier. Swivel feature enables you to move around without getting up from the seat. Hope the above guide helped you in choosing the right ergonomic office chair and the benefits of choosing the right chair for your work. Any ideas and thoughts on the topic are welcome.